We are a bit late on this one, but we still thought we ought to feature it nevertheless. 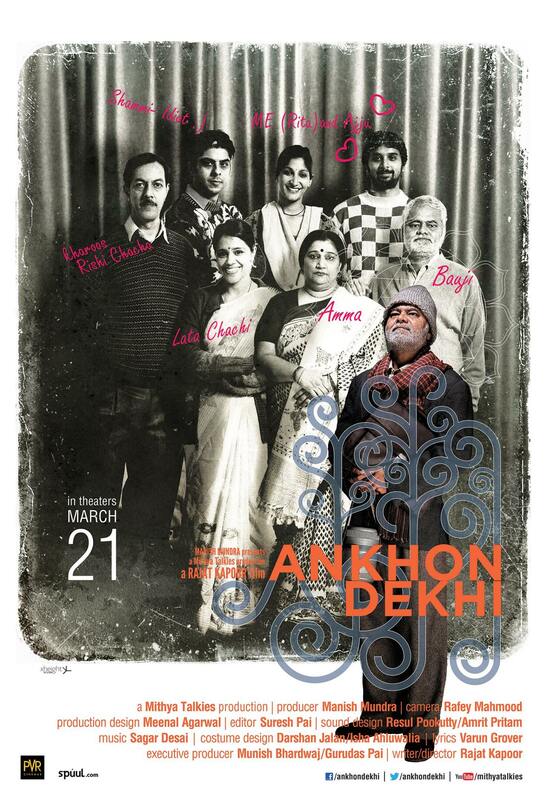 The poster and trailer of Rajat Kapoor’s Ankhon Dekhi arrived online sometime back- and while we are not quite sure how well they sell the film or convey what it’s really about- they give us a feel of the world it’s set in. Some of us happened to see the film a while back and the reactions were pretty good. It’s an oddball, quirky film that goes through some distinct shifts of tone but always remains interesting and thought provoking. It’s also powered by some good performances from a strong cast led by Sanjay Mishra. ‘Ankhon Dekhi’ is the story about ‘Bauji’, a 55 year old man, who lives a dreary but eventful life in a joint family, that shares a small house cramped with people and drama. One day Bauji has an epiphany and decides that from that point on he would only believe what he sees with his own eyes, nothing else can be certain. There are a quite a few challenges on his onward journey- but Bauji never loses sight of what is before his eyes. Produced by Manish Mundra, the film has been written and directed by Rajat Kapoor, who also stars in the film. ‘Aankhon Dekhi’ also features Sanjay Mishra, Seema Pahwa, Taranjeet, Maya Sarao, Namit Das, Brijendra Kala and Manu Rishi Chadha. Varun Grover, lyricist and our editorial member, has written the songs for the film. And here we have an interview of Rajat Kapoor where he speaks about Ankhon Dekhi and the challenges of making his brand of cinema. Read the poetry. Guess the film.